My husband took one look at this pizza and said he was headed to the store for pepperoni. Since it was ready to bake and would be done in 15 minutes I convinced him to wait and try it. He did and he actually thought it was “ok”. I thought the pizza was pretty good, and yes I did want to eat spoonfuls of the onion confit alone! I was not overly impressed with the crust, however, I think I added too much flour. I’ll probably try the crust again some time and be more careful about adding the flour before I make my final decision on the crust. If you would like to try this unusual and tasty pizza, Paul of theboycanbake is the host this week and he has the recipe on his blog. The recipe can also be found on pages 157-159 of Baking with Julia. Check out the “Leave your Link” post on Tuesdays with Dorie to see what all the bakers thought about this pizza. I think I added too much flour as well. 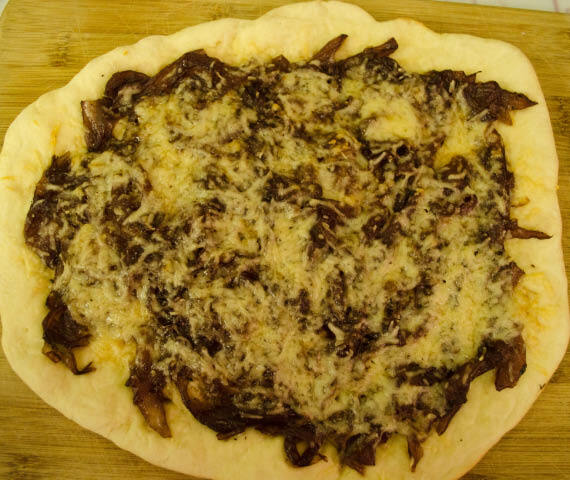 I used half of the dough the first night with the onion confit and I thought the dough was a little stiff. But the other half that spent a night in the fridge turned out so much better. I think it just need to relax a bit. If I make it again, I would decrease my flour or add it more slowly to ensure I’m not adding too much. My dough came out very nicely, but the onion confit was a bit much for me- I will decrease the sugar next time for sure! Your pizza looks wonderful- hope it was delicious! It did taste great, but it’s probably not something I will make again. I loved this pizza. It was hard not to eat all the confit before it made it on to the dough! I will be making this again soon. This was a fun one to try even if it doesn’t become a regular.